Who knew that a brief discussion about a "refresh" more than a year ago would result in a creative and engaging process culminating in a new strategy? As a staff member who participated in this effort alongside our board, I have been impressed with the thoughtful and honest discussions for crafting a narrative that not only caught up to where we are today, but envisions a future that continues to position us as relevant and responsive to our members and the field of philanthropy. Special thanks to Kevin Walker of Northwest Area Foundation, Mauri Ingram of Whatcom Community Foundation, Doug Stamm of Meyer Memorial Trust, Kathy Bryon of Gordon Elwood Foundation and Steve Moore of M.J. Murdock Charitable Trust for being our go-to-and-get-it-done work group between board meetings and retreats. Our board also expressed deep appreciation for Mark Sedway of The Giving Practice, our national consulting team, for artfully guiding this strategic planning process by asking great questions and prompting us to express our passions, agreements and even a few disagreements. We asked ourselves: What is our vision for our communities, the field and our members? Which qualities make philanthropy most effective, at its best? Across our diverse six-state network of nearly 200 philanthropic entities, which key values are shared? How can we deliver value to the sector and what kind of organization do we want to be? The board worked from the outside-in, by first envisioning what Philanthropy Northwest ultimately wants to achieve in our communities, then what kind of philanthropy sector would best support that vision, then what values our broad network holds. Finally, we considered our internal values and aspirations. 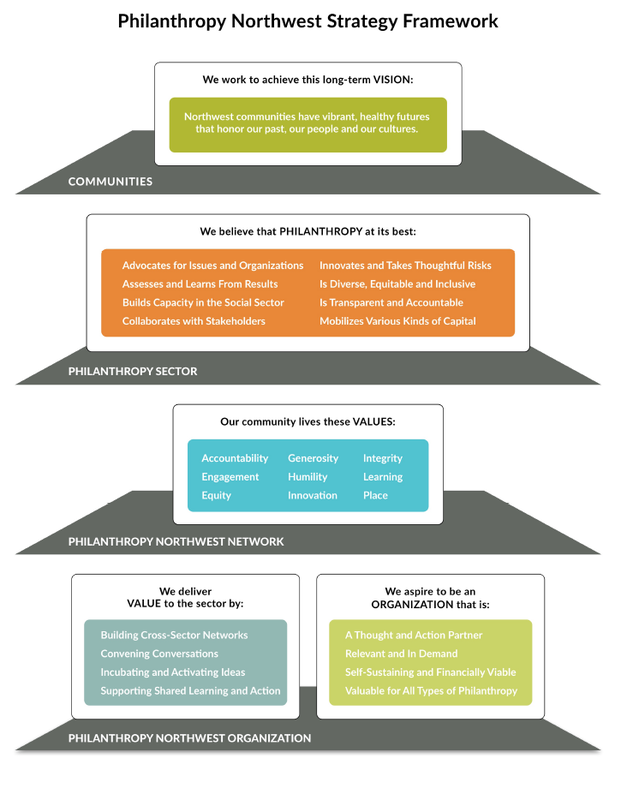 Our resulting framework represents Philanthropy Northwest’s ongoing journey toward convening conversations that promote relationships and cross-sector connections that lead to action; advancing place-based philanthropy; and forging partnerships for vibrant, equitable and inclusive communities. Serving our members remains a key component of our organization, but we have also evolved to strengthening the field through consulting, convening and incubating new ideas and projects. I’m proud of the work we're doing to discern our values and the ways we embrace them every day. Most of all, I'm inspired by our vision: Northwest communities have vibrant, healthy futures that honor our past, our people and our cultures. Northwest communities: All philanthropy ultimately manifests itself as action, impact or change in one or more communities. The Northwest is our organization’s home. We are passionately dedicated to this place in all its diversity, and while our work sometimes resonates and draws us beyond its boundaries, our place and its values ground us in a world of fast-moving change. Vibrant, healthy futures: Philanthropists engage with their communities to improve them in many different ways. The notion of “community health” includes healthy people, healthy ecosystems, healthy economies and healthy civic institutions. Our past, our people, our cultures: We work in a vast region of extraordinarily diverse landscapes, people and cultures — with complex and sometimes contested historical experiences. We strive for a philanthropy sector that supports each community's ability to determine its own future. Take a look at our new framework. Over the next year, we will work on refining Philanthropy Northwest's mission statement and program offerings, with your input. We look forward to hearing what resonates with you. Audrey Haberman is Philanthropy Northwest's interim CEO and managing partner of The Giving Pratice, our national consulting team. She can be reached at ahaberman@philanthropynw.org. I like the re-stated vision and am excited where it takes PNW. What I don't see is a commitment to rigorous evaluation of the programs we fund and a promise to use what we learn in determining our future directions. The evaluations don't need to take the form of PhD level research studies, but I believe we should hold ourselves and our grantees accountable for committing to evaluate our programs and processes and putting these learnings into action. I think there is a place in the "We believe philanthropy at its best" section to acknowledge social change. Targeted and thoughtful philanthropy has a powerful ability to transform people and communities in positive and lasting ways.